Naturopathic medicine focuses on the innate healing capabilities of the body. Though not directly written in the Hippocratic oath, the patient’s well-being is the primary consideration that every doctor strives to embrace. By following a therapeutic order for the treatment of skin conditions, the naturopathic approach to healing often begins with less invasive forms of treatment before utilizing more invasive forms. As the treatment forms become more invasive they may carry additional risks, cost, and side effects, which in turn leads to more physical and emotional stress on the individual. Although the therapeutic order may be an acceptable method of treatment for a majority of conditions, naturopathic practitioners recognize that certain conditions warrant a deviation from the standard flow. For example, a person who has melanoma (a serious skin cancer) should not begin treatment with the first few phases of the therapeutic order. They should immediately move to the opposite end of the therapeutic order and have the lesion removed as early as possible because melanoma is known to evolve over time from localized lesions to aggressive tumors that often metastasize. Early diagnosis and complete surgical removal is critical to minimize the severe, potentially fatal, effects of the disease. Additionally, a person may not need to follow every phase of the order if health is achieved early in the treatment. Quite often the issues may be resolved following the completion of one of the early phases. Once the issue is resolved the treatment plan becomes one of maintenance and optimization of health. Many skin cancers will never need the most invasive treatment phase (surgery, chemotherapy, or radiation) because they can be managed with the earlier phases of the plan. The human body and mind have an innate ability to restore and maintain health. Naturopathic practitioners strive to preserve and support this innate ability by attempting to remove any obstacle that may be blocking the road to health and by promoting improvement of the normal physiological and metabolic function within and around any damaged system. Underlying causes of disease must first be recognized and removed before real healing can occur. Symptomatic control can appear to be healing, but is only palliative and never fully leads to health. This principle is often difficult and time-consuming but is sometimes the most invaluable principle of naturopathic medicine. It is well known that many different factors can cause problems for the skin, and all of those must be considered in order to achieve optimum skin health. Mental/emotional, environmental, nutritional, lifestyle and many other influences can affect the skin. Psychological stress may cause or worsen many skin conditions. In the case of acne, some people may have breakouts after an emotionally stressful event, and practically everybody who experiences acne has some level of stress during a breakout. Another aspect of treating the whole person is to treat other body systems that may not be the obviously dysfunctional system, such as the digestive system. Possibly the most important aspect of this principle of treating the whole person may be in the vocabulary. The person is being treated, not the condition. It may sound like the same thing but is actually very important to consider when discussing conditions with patients. There is a difference to the person who is living with the condition. For example, a doctor sees a patient who has shingles. If the person was labeled as a shingles patient, the individual may feel removed from the healing process. Instead, a simple change in approach to treat the patient rather than just the symptom or disease can have a profound effect on relationships with patients and can promote the healing by developing a deeper connection between the provider and the patient. The words doctor and teacher originated from the same Latin word: Docere. Doctors are some of the most highly educated professionals and it is important that they share this knowledge with others. Healing should not only happen at the doctor’s office. It is essential that every individual at least understand how to live healthy. Naturopathic practitioners teach people how they can support their individual skin health and also teach them the signs and symptoms of conditions that are of concern. The modern Hippocratic oath also states, “I will prevent disease whenever I can, for prevention is preferable to cure.” The focus of prevention should include building overall skin health. This can only be attained through education and habits that promote optimum health. Naturopathic practitioners utilize a wide range of treatment modalities. Naturopathic medical schools provide in-depth education in nutrition, botanical medicine, and therapeutic lifestyle counseling, in addition to the pharmacology training that is standard at other medical schools. This wide range of treatment options helps to offer a unique treatment plan for each patient that helps the skin to heal and optimizes function. Naturopathic practitioners promote an ancient philosophy that food is medicine. This medicine, in its most ideal form, is whole, unprocessed, and directly from the earth. The core of almost every healthy diet is the consumption of whole, plant-based foods. The other layers of common high-quality diets may include healthy fats, lean meats, and minimal consumption of sweets. With statistics showing that obesity is an epidemic, it is easy to assume that most people would feel better, at least in some way, with a more optimal diet. Nutritive approaches to skin care can, in some cases, provide superior relief to any other treatment protocol. One of the common reference textbooks used in many dermatology courses is called Habif’s Skin Disease Diagnosis and Treatment. In the second edition released in 2005, the author denied the correlation between diet and acne by saying, “fatty foods cause obesity, not acne.” In the 5th edition of the book released in 2010, the author offered a new perspective by suggesting that diet therapy be used as initial approach because the evidence is mounting that high-glycemic carbohydrate foods (bread, bagels, doughnuts, crackers, candy, cake, chips) that substantially boost blood sugar levels trigger a series of changes that cause acne. The use of herbs could possibly be one of the earliest forms of medicine, and many modern pharmaceutical medications are obtained from substances found within herbs. 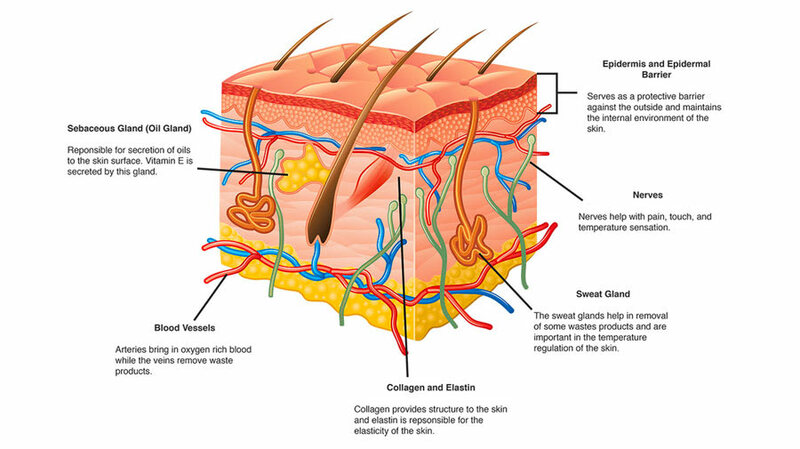 Some of the common herbs used for the skin include aloe vera, oats, Calendula, Tea Tree, and many others. Herbs can be used internally or topically and come in many different forms. Naturopathic practitioners use knowledge of herbal medicine that has been used for thousands of years by many cultures across the world, in addition to what is gleaned from modern scientific studies. Pharmaceutical medications are by far the most common treatment form in the medical field. Medications are often necessary for the treatment of certain conditions. Unlike many of the other treatment modalities, drugs are highly regulated, evaluated, and require approval and rigorous testing to be released as treatment. Pharmaceuticals are usually an active ingredient that is either synthetic or obtained from a plant or organ that is processed and then concentrated to a specific dose. These three treatment modalities are only some of the tools that naturopathic practitioners utilize as forms of treatment. Additional methods include physical medicine, aromatherapy, intravenous therapy, injection therapy, stress management, and homeopathy.